Michael Hollinger’s “An Empty Plate in the Café du Grand Boeuf” is a story that’s really about people with more on their plates than they can handle! Victor certainly seems unable to deal with the interesting dishes life has set before him. He’s a devoted Hemingway enthusiast, and began his career as a young journalist for his father’s newspaper. Along with writing, he was expected to do anything his father required, including babysit. At his father’s death, he found himself quite wealthy, and 47 million dollars is hard to spend. He remains devoted to the ideals of Hemingway his entire life, living the easy life. He becomes the owner of a restaurant, the Café du Grand Boeuf, that boasts the most delectable fine French cuisine available, yet they may only serve Victor and his companion Louise. The year is 1961, and Ernest Hemingway, struggling with severe depression over the loss of his writing ability, has accidentally shot himself. Victor returns from the bullfights in Madrid, alone, and everyone is desirous of serving ‘Monsieur’ as they call him. The distraught Victor announces his impending suicide by starvation and his employees, seeing their jobs disappear as well as losing their benefactor, decide to entice him into partaking of their seven course meal by describing in great detail the dishes as they set an empty plate before him. Victor is immune, paraphrasing Hemingway inaccurately. 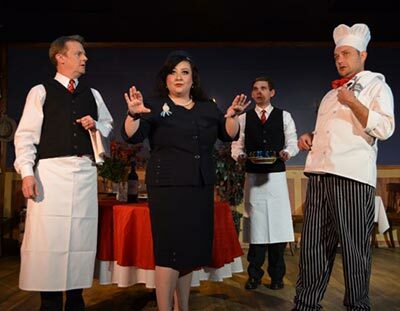 When the staff worries about their boss’ lady love, Mimi exclaims her suspicion, “She’s dead!” Pictured left to right Kevin Moore, Holly McNatt, Cam Taylor, and C.W. Bardsher. Linda McDonald, always an astute director, selects six performers to portray the dark and appetizingly hilarious events from one summer evening in 1961. 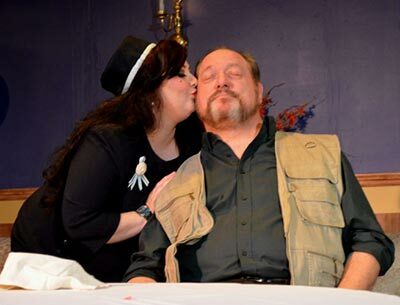 Glen Hallstrom plays Victor Bullard, the eccentric multi-millionaire. Hallstrom is physically ideal to play a Hemingway character and uses his characteristics to advantage. Kevin Moore is Claude, Maître D’ at the Café de Beouf, who manages the staff. 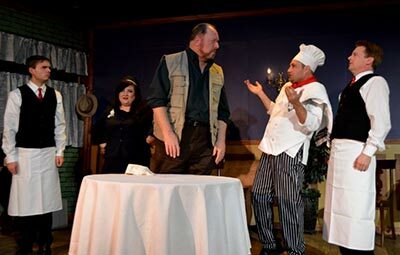 Holly McNatt is Mimi, typical French waitress, and C. W. Bardsher is Gaston, the exotic premier French Chef. Claude is training Antoine, the new waiter replacing the recently deceased Pierre. Cam Taylor plays the hesitant and musically challenged Antoine. Renee Krapff is lovely Louise, the mysteriously missing companion speculated about throughout the show and seen only at the end. Hallstrom and McNatt, while both excellent actors, seem a bit uneasy in their skin. As Victor, Hallstrom at first seems the confident and eccentric gentleman. The depression that Victor feels looks more nervous than depressed, otherwise he’s very good in the role. McNatt never develops the femme fatale aspect of Mimi, or the faux femme fatale that Hollinger has written into the character. She seems nervous, picking at her clothes incessantly. These are minor flaws; only visible against the backdrop of the perfectly hysterical characterizations by the other cast members. Bardsher’s Chef Gaston has an almost stereotypically familiar ego, playing it wonderfully. Magnifique! Moore’s headwaiter Claude, describes each dish with such a feast of descriptive adjectives and vigor that the stomach begins to growl, although Victor remains unmoved. Taylor’s Antoine is disingenuously shy about entertaining never skipping an opportunity to play ‘The Lady from Spain’ on his saxophone. Krapff plays the classy Louise easily, cementing the entire piece, and almost stealing the show. Victor re-enacts a bullfight from his trip to Madrid as the cafe’ staff cheers him on. Pictured left to right are Glen Hallstrom, Holly McNatt, C.W. Bardsher, Cam Taylor, and Kevin Moore. McDonald’s direction is always spot on, and technically the show demonstrates her usual accurate perception. However, when Victor brandishes the gun provided by Gaston, he’s reminded by Antoine* to take the safety off. Antoine points to the place where the safety is located on a firearm, however, the gun they use is a single action revolver—there is no safety. While many people are not necessarily familiar with guns, almost everyone can tell the difference between a single action revolver and a double action or automatic, so the error seems more glaring to the average viewer than anticipated in the properties department. With a slight change in props, or a change in Antoine’s dialogue, and a bit of relaxation on the part of the actors, the show will be a major hit for Carpenter Square; it comes so close now that any audience will enjoy the show, and delight in a late evening supper! Take time before the show or during intermission to view the lovely art work by MtnWoman Silver. Her modern acrylics are exciting with dramatic use of color and design. Chef Gaston reluctantly reveals a secret about the dessert their boss has just eaten. Pictured left to right are Cam Taylor, Holly McNatt, Glen Hallstrom, C.W. Bardsher, and Kevin Moore. 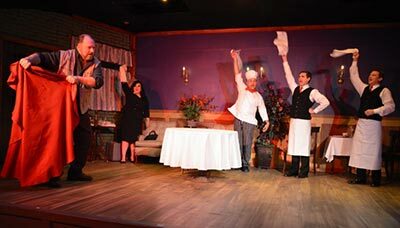 “An Empty Plate in the Café Grand du Boeuf” plays through December 15, 2018 at Carpenter Square Theatre. The theatre is located at 800 W. Main in downtown Oklahoma City with convenient parking across the street. For information and tickets email csttix@coxinet.net or call 405-232-6500. Bon Appétit–it’s all in the presentation! Thank you for your detailed reviews as always. But I noticed in the review you said that the character Antoine talks about the safety on the revolver. I attended the show opening weekend, and I remember that it’s GASTON who provides the gun and also reminds Victor about the safety, not Antoine. I’m sorry I missed seeing you Saturday night. You must have been incognito. Thanks for taking the time to review our show and the fine comments. It is appreciated! Thanks for coming to the cafe Elizabeth! We’re glad you found it tasty.